One of the analyses that I have done from time to time is Time Parting Analysis. Time Parting Analysis consists of looking at the time of the day (or day of week) that website success takes place in order to better understand its importance. While I don’t usually put a whole lot of stock into the time of day, there can be times where websites do much better/worse in the morning vs. evening. Knowing this can be used when planning advertising so you can “strike while the iron is hot,” so to speak. As you can see, this report allows us to see what the action is taking place on our website down to the half-hour increment. If you are not already doing this type of analysis, it may be worthwhile since you can glean some new insights and use this data point for visitor segmentation. The next problem you will encounter is that of multiple time zones. If you work at a global organization and have people focusing on business in various locales, the above report is pretty much useless to many of your internal customers. If they happen to be good at math and can calculate time zone differences in their head, then you’ll be ok, but most people have trouble interpreting web analytics reports without the added labor of doing on-the-fly time zone translation! Want to see this problem in action? Take a closer look at the report above. Do you notice anything strange? If you look closely, most of the Visits and Form activity took place in the evening. People might like your product(s), but not so much that they are willing to spend their evenings looking at them! The reason the above report looks strange is because it is for an Australian website, but the time zone is Pacific Standard Time. If you are a web analyst in Australia, seeing your website success events in the Pacific Time Zone is not super-helpful! You will notice that now we are seeing the same exact data as the first report, but now the times of the website successes are adjusted for the Sydney time zone. This makes the report look a bit more normal for the Australian web analyst as the success events are now shown as taking place during more realistic business hours. The best part of this solution is that anyone using the standard Time Parting plug-in Omniture provides can use the same SAINT Classification file. It just needs to be adjusted so the “Key” column is the time zone for which you are collected the data. If you are using the PST time zone, you can download the file I showed above. If you are in a different time zone, you can still download the file and adjust it as necessary. Time Parting reports can also be used to track Day of Week. This is harder to adjust for than is time zone unless you are time stamping using the actual date and are willing to have a massive, multi-year SAINT Classification file. This is not a bad approach, but is much more involved. Contact me if you’d like to explore this. It is possible to collect time zone data using different time zones for each report suite. For example, it may be better for you in the long run to have your Sydney data collected in the Sydney time zone and your London data in the London time zone, but I have often seen clients have issues with this and if you don’t start doing this from the onset, you can have issues going to it later. Please consult your account manager for more details. If you have any questions or want to learn more, feel free to contact me for more information. Very clever hack Adam! I like it a lot. 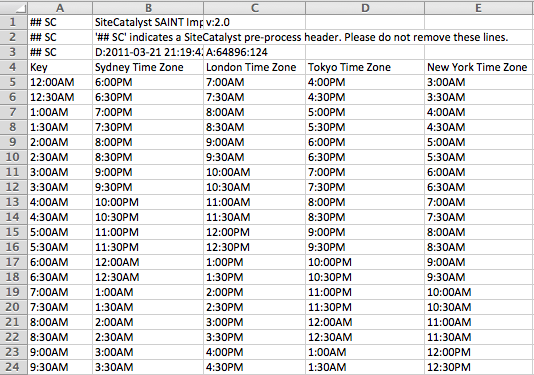 SAINT is one of those underused parts of SiteCatalyst. It’s always seemed very strange to me that Omniture relies on a client-side clock for Time Parting. There’s now, finally, a VISTA rule to use the server-side clock. The problem is that ordinary web users’ clocks can be enormously out! To make matters worse the end users might have their regional settings completely wrong so you’ll get timezone transformations that aren’t even close. If you have client-side time parting, have a look at a specific day and look a the day of week time parting and you’ll see data coming in for different days of the week. So get the VISTA version to be sure. Then you can use it with mobile too. The SAINT thing described above will still work too, only the data will be more accurate. To demonstrate quite how wrong the time parting client-side can be, I’m looking at today’s data for our sites (used mostly in Australia) at midday in my time zone, so it’s Wednesday in all of Australia right now. 1.9% report Thursday. It’s not Thursday yet anywhere in the world. 0.5% report other days of the week. Adam – thanks for a great post. It’s early here (GMT) and I’ve not had enough coffee so would you please explain / show an example (or tell me a site) that’s using the time zone in addition to the time parting so I can see how it’s being set. What drives me nuts about Omniture’s reporting, particularly for time related reports, is that I can’t rank by the parameter value. ie to rank by the time of day (ie 00:00 through to 24:00) rather than being limited just to ranking by the highest or lowest time part value. This really is basic functionality that should have existed over 10 years’ ago. Simon – I’d not heard of the time parting Vista. Is this chargeable or free (or is this a silly qu)?